At this time last year, Sam Cross was enjoying an All-Ivy League season for Harvard's men's fencing team, which was on its way toward winning league and national championships — no easy task. Today, Sam faces a much tougher challenge. Cross was diagnosed during the holiday break with acute myelogenous leukemia — a fast-growing cancer of the blood and bone marrow that typically affects older adults. Sam has already begun chemotherapy treatment, but is in need of a bone marrow transplant to optimize his chances for a full recovery. 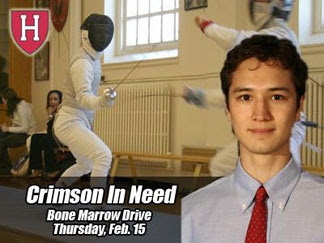 To that end, representatives from The Marrow Foundation will be on the Harvard campus Thursday, Feb. 15 from 11:30 a.m. to 4:30 p.m. at the Harvard Hillel, located in Rosovsky Hall at 52 Mount Auburn Street in Cambridge. Rpresentatives will be present to screen volunteers as potential donors. For more information about becoming a bone marrow donor, visit the National Marrow Donor Program. Thursday, February 15 • 11:30 a.m. to 4:30 p.m.